In many parts of the world, people use garden machetes as a part of their daily lives. The fact that they are capable of acting as both an ax and a knife makes them quite versatile. Garden machetes can be used to clear bushes and scrubs, clear woody vegetation, chop compost, coppice trees for charcoal or firewood, strip bark from tree trunks, and much more. Garden machetes also come in a wide range of shapes and sizes, having evolved into different adaptations and styles with varying features. When shopping for a machete, the five most important factors that must be considered are its blade composition, blade length, blade style, handle material and style, and its tang. Keeping these in mind, below are the top 10 best gardening machetes 2017 that are worth considering. Despite being last on this list, this is perhaps the most unique of them all. It must already be obvious that this is more than just a mere machete. This Machete Axe from Fiskars is quite versatile, so it can help chop roots, clear thick brush, cut branches and palms, and a lot more. With its 18 inch-long, rust-resistant blade that has an axe-like shape at the top, this ultra-sharp machete axe has been designed to perform powerfully and rapidly. An intelligent texture pattern is featured on its comfortable performance handle, so it can be held differently for varying uses. With this SOG SOGfari 10″ Machete, brush can be cleared and wood can be chopped quite easily. This machete is capable of conquering any outdoor task since it is equipped with a 10 inch-long 3CR13 steel blade that has a fully functional saw on the back. The blade even has a spiked tang for pounding and scraping. 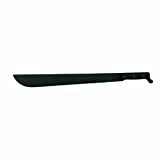 Overall, this machete has a length of 10 inches, which includes its comfortable, Kraton handle that ensures a solid grip and even a lanyard can be attached to it by passing it through the hole. Additionally, a ballistic nylon sheath is also included with this machete. This Ka-Bar Black Cutlass Machete is capable of clearing plants and weeds, no matter what the setting. Therefore, it can be used as a garden machete while working in the backyard or even during a camping trip while exploring new terrain. This 16 and a half inch-long Cutlass Machete has a comfortable Kraton G handle with an extended, 1085 carbon blade that is 11 inches long, so overgrown areas can be easily cleared out. Even new trails can be blazed out quickly with this machete. It can even be carried around easily since it weighs just 1.12 pounds, and comes with a stylish, cordura and leather sheath. The Ka-Bar 2-1249-9 is a type of machete known as a Kukri. A Gurkha blade or Kukri originates from Nepal and since its blade has three distinctive areas, a kukri can be used to carve, chop, stab and whittle. 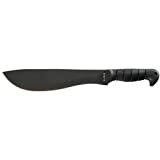 This Ka-Bar 2-1249-9 Kukri 1085 carbon steel blade that has a length of 11 and a half inches. This kukri may seem short, but it is actually 17 inches long overall, including its solid Kraton G handle. This kukri machete weighs just 1.26 pounds, so it is not too heavy. When not in use, the kukri machete can be carried in its leather sheath that comes with it. The Gerber Bear Grylls Parang Machete is a good example of the fact that machetes come in a variety of different unique shapes. 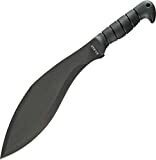 With this parang machete, Gerber has basically added a modern touch to the traditional machete of the jungle tribesmen. Golok or Parang machetes are known for their distinctive angled blade, such as that of this Gerber one. It actually has a robust, full tang high carbon steel blade that 13.5 inches long, while this entire machete has a length of 19.5 inches. Its rubber handle is ergonomic and textured, with a lanyard cord attached to it, while this machete comes with a nylon sheath. The Ontario Knife Co. 1-18 Machete is not an ordinary garden machete rather it is a Military Machete. This machete itself is 23.25 inches long, but as its name suggests, the blade has a length of 18 inches. It is equipped with a full tang 1095 carbon steel blade that has a black zinc phosphate finish over it and it has a thickness of 0.125 inches. This machete also features a high impact, shatterproof polymer handle that has steel compression rivets over it. Ontario Knife Co. has been manufacturing this machete for the U.S. military for more than 60 years, so it will perform exceptionally as a garden machete. This Gerber Gator Machete is ideal for clearing bushes, invasive plants and weeds. It has an overall length of 25.7 inches. This garden machete is equipped with a high carbon steel, sharp blade that is 18 inches long. The blade has a sharp, thin edge on one side, while it is a saw blade on the other side, which makes it somewhat of a dual purpose machete. This garden machete is also equipped with an ergonomic, polyamide and rubber handle, making it easier to maintain a solid grip when swinging this machete. When being carried around and/or or not in use, the blade can be safely placed within the riveted, nylon sheath that comes with it. Tramontina is a Brazilian brand, and a variety of trades through North and South America use Tramontina machetes like the one featured here. This is essentially a bush machete, but along with being useful for cutting green vegetation, it will also serve as a handy all-purpose utility tool. It is ideal for anyone who wants a decently heavy machete that actually works, with a blade made of good steel. The length of its blade is 18 inches while this machete has a weight of 1.1 pounds so it is not too heavy. Most distinctively, it has a wooden handle instead of plastic or rubber one. Regardless of its name, this is actually a Golok machete from Condor Tool & Knife. While it can be regarded as somewhat of a survival knife, that does not change the fact that it is still a machete a golok style blade that is 11 inches long. Adding the length of its smooth walnut, triple riveted handle, this golok machete is actually 17 inches long. Its curved handle will make it easier to chop things, while its distinctive tip is ideal for digging and prying. These machetes are already sharpened in the factory, so they happen to be razor sharp when they arrive. Golok is another name for the parang type of machetes. This Golok Machete from Condor Tool & Knife is ideal for cutting woody material since it will not lodge into them. 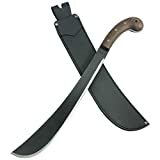 Since it is a golok machete, it has a thick blade made of 1075 High Carbon Steel with a black powder epoxy finish on top, having a thickness of 1/4 inches with a distinctive taper at the end. The blade arrives razor sharp and will not have to be sharpened. Something that sets it apart from the above machetes is that it is equipped with a walnut handle, while it also comes with a leather sheath. Thus, garden machetes like the ones above can come in handy in a wide variety of situations, from survival to just serving as a utility tool that can be used for various purposes. So, all those who are shopping for a brand new, razor sharp machete that will get the job done, the above top 10 best gardening machetes 2017 are worth considering.